Another day, another breakfast. I get the feeling the weather may be about to turn; there’s a generous bowl of porridge this morning, a pot of coffee in addition to the usual orange juice. I wish once again that I could have coffee every day. Halfway through, it starts to rain. Great. This means I will spend at least part of the day inside. So. Not. Thrilled. And yet, down the stairs I come, because there’s even less to do up there. I’ll try reading for a while, and I might or might not just give up since I’ve read them all (well, almost all of them: there is this huge and bloody dry one called The Silmarillion that I’ve given up on more times than I’ve read most of the others). This is my nap face. Maybe I’ll spend the morning napping on the couch on trying not to think about things too much. I don’t really like napping. This is my nap face, though. It’s a good nap face. But there’s that damn beeping noise again. Beep-beep; beep-beep; beep-beep. Am I crazy, or is it more frequent today? I’m probably crazy. Or perhaps it’s the sound of an approaching Prince. Let’s go with that. Aaand.. that-was an abysmal failure. Super. The windows are still rain-streaked, and I’m sure this break in the rain is only temporary. I hear laughter in the distance. Perhaps the gods or goddesses of fate are laughing at my stupidity, thinking I could get a nap on a rainy day in my lonely little world. I wander over to the music-box Shelf. Sure, I’ve heard them all before, multiple times. But somehow, even though I know in my heart there must be more music then I can imagine Out There…the familiar tunes are comforting. What does this stuff do? What does this stuff do? I have no freaking idea. But I’m sure if I explored the much more dry books that reside in the cabinet below these shelves, I could figure something out. Of course, there’s no point in learning to make poisons if I’ve nobody to poison. Maybe this is all stock knowledge for the future. I could come away from this place with a stockpile of poisons, in case my Prince doesn’t turn out to be my perfect match. Then I’d be a widow with a really big dowry. This shelf is a relatively new addition to the tower, so I haven’t really explored it yet— but some of those bottles contain things that smell right nasty. When I make my way back over to the bookshelf, possibly to read Gossamer Axe one more time, I see that someone or something has placed yet another tea service on the table. What’s with all this tea? No sandwiches, no biscuits, just tea. Obviously it’s not lunch time yet, but do they really expect me to drink all this tea? Three pots full? Perhaps it is some kind of tea test. What sort of test could you take with tea? Beep-beep; beep-beep; beep-beep. Murmuring voices. A different series of beeps. Are they (whoever they are) trying to drive me round the bend? I know: I shall ask the Wishing Fairy to take all these noises away. Sure, she’s a silver cast statue— but she’s the closest thing to a full-size companion I have in this place of weirdness. “Hey,” I say, “Wishing Fairy.” (I don’t know if that’s her real name but I’ve called her that since I’ve been here and she’s never objected) “Can you make those noises go away? I’m really tired of them.” And suddenly I have a coughing fit. I don’t know why. Great. My handkerchiefs are upstairs. I go up to retrieve the handkerchief, and I feel dizzy on the stairs: that’s unusual. On the way back down, handkerchief in hand, I have to use the handrail. Still a bit dizzy, and the fall would be pretty bad, I assume. At the bottom of the stairs, I take a few deep breaths and look out the window. The rain appears to have stopped, so I can get out of this stuffy tower, at least for a little while. So, back to my favourite reading bench I go, copy of Gossamer Axe in hand. It’s one of my favourites, even though I don’t know the first thing about the kinds of music they talk about in the book. It’s my favourite first line ever, though. Every day’s the same. I get out of my beautiful bed with all the fluffy pillows. I attend to my personal toilette. I put on the single dress in the wardrobe. I make my way up to the tower roof to eat the breakfast that will be waiting on the table there. And then, I go down into the garden. I am surrounded on all sides, by walls, flowers, topiary, trees. This is my garden, or I’ve always thought of it as my garden. There are times when I think I know it so well I’ll scream from the sameness of it all. But then sometimes, something changes. Today, it’s this heart-shaped tree of roses. It’s just enough to delight me for a time, to make me reach for the familiarity elsewhere in the garden. There used to be a bench here, but now there are just the three identical benches around the garden’s central circle. I wonder if other things in the centre will change, and I wonder when. I must be a princess. I must be a princess, yes? I know from the storybooks on the ground floor that only princesses get locked up in towers and taken care of by forces they cannot see. It seems the only explanation for why I’ve been here for as long as I can remember, why I see no-one. I know that princesses in towers are either being groomed for their destiny, or somehow separated from it. There’s a loud beeping sound, something harsh and out of place. Three sets of two beeps: beep-beep, beep-beep, beep-beep. It stops for a few seconds, then starts again. Then, by some grace, it stops altogether. I hear a murmuring voice in the background. But by this time, I know that voice is just the wind, and I suspect the beeping noise is some trick wrought by the unknown magician who imprisoned me here, something to make me not wander round the garden as if sleepwalking. It’s not the first time it’s happened: it sometimes happens more than once a day, but always at least once. Although it’s been happening for as long as I remember, it still shakes me, still brings gooseflesh to my arms. It’s so different from the quiet rush of the waterfall, the chittering of birds, wind in the trees. My beautiful statues keep me company. Throughout the garden, there are beautiful statues, and they keep me company. I sometimes talk to them. I imagine they answer back, but I don’t know how a real conversation works. If another person, someone like me, walked into the garden and began talking to me, I think I’d run. Or faint. Fainting might be more seemly in this dress. Here is what I would look like right before I fainted. Here is what I would look like right before I fainted. I’m sure I’ve seen a picture of a Princess fainting somewhere, and she was definitely doing this with her right arm. Days grow longer and shorter. Days grow longer and shorter; that’s how I can tell there are seasons here. I get up when it’s light; I go to sleep when it’s dark. It’s an easy way to keep oneself on some kind of schedule. I don’t know why I need a schedule, but it seems important. The flowers change more often than anything else. After I talk to the two statues, I make my way to the flower beds. The flowers change more often than anything else, but they are always in bloom. I used to think if I somehow stayed in the garden all night, I would find the beings who plant and maintain them, but I never can stay awake all night. Someone is crying; it sounds a long way away. Faeries in the wood, I tell myself. Trying to trick me into somehow scaling the walls and going to find the baby. It’s a trap I’ve read about many times. Is someone watching me? I wonder what it would look like from afar, if they were. They’d see the beautiful garden all spread out before them, the pink and blue sky, the lighted trees—and the lone princess, about to sit down on the bench where she always has her lunch. Lunch arrives in a little box, and I never see them leave it. Today it is a fresh salad with tomatoes. I pick out the onions. I do not like onions. I rationalise my dislike by telling myself that when a Prince comes (and he undoubtedly will; it’s in all the stories), I do not want to have bad breath and scare him away! Is there more than this? I sometimes wonder if there even is more than this. If one day I’ll wake up and there will be nothing outside: no walls, no trees, just a big span of nothingness, whatever that looks like. Sound of murmuring voices. Sometimes they get a bit louder, but I can never make out what they’re saying. Crying. A shout. A series of beeps. Setting Up for Writing Retreat! OK, so I just got here and have taken a couple of hours to put things together, and you guys are not going to believe this place! We’re going to have the best week ever. I met the Air B&B owners at their place in Awenia, and they showed me to the portal. I don’t know if all you guys have travelled by portal before, but hold on to your stomachs. I set one of the drones up outside the front gate so you’ll be on portal cam too when you arrive. The gates open automagically when you approach them, which I guess would be a problem if we were anywhere but in a hidden B&B that one can access only via portal. Luckily, we are in a hidden B&B that one can access only via portal. So you all keep asking me what the place looks like, and I can finally tell you since I’ve now actually seen it. This is the one writing area that’s upstairs. So whoever likes the breeze the best and needs a typewriter instead of a tablet or a notebook might really like this spot. Everything else is downstairs; you all will love it: you have to go through a secret door to get to the living space. Just push the candle, and the panel will slide to reveal the stairs. For the four of us, I think this space is huge, and it has such a cool vibe! There’s plenty of couch and chair space to stretch out on, and I don’t even think you’ll mind that it’s self-catering: the kitchen looks pretty nice, as well. There are four of these lounge-style daybeds. One of them is in an alcove just out of sight here, on the left. I took that one: sorry, ladies! The other three are separated by the pillars. I took it this way because I love that bookshelf. So much of the decoration here, even though it’s sparse, is really, really cool. The picture doesn’t do this justice: once you get here, take a look at that amazing root system in the corner here: it looks like it was made for that nifty bowl of crystals, yeah? And just so you guys don’t think I’ve lost my marbles and been replaced with some sort of estate agent-style pod person, check out this sweatshirt! I saw it and couldn’t stop laughing, so I knew it had to be mine! The garden is not shabby, either, and I think if you wanted to write outside in nature—well, whatever kind of nature this is, anyway, you could really enjoy it up here. This is a little fae garden display, just tucked into one of the building’s corners. I heart it! See, I’m not a pod person at all! The trees out here are really cool: you will love them. And the sky—I don’t know if it comes across properly, but the sky is amazing, sort of pink and blue at the same time with the pink not being to obscenely girly. Also, I got these new nail wraps from Koffin, and they are so cool! I don’t know if you can see properly in the photograph, but they have little owls on them. I squeed. Right: I’m going to portal back down into Awenia, now that I’ve got my stuff put away and sent you guys all these cool photos. I figure I’ll do some grocery shopping so when you all get here tomorrow we’ll be mostly stocked. Don’t forget to bring stuff you really like from home: Awenia is like the smallest Fae Realm I’ve ever seen, so I don’t think they deliver pizza out here. Trick Or Treat Lane Opens Tomorrow! There are so many cool things to show you, but for now, I’ll just let Angharad gush about this insanely cool hoodie from The Nerdy Birdy. And it comes in pink! Angharad argued that she would not show off this hoodie unless it could be produced in pink, and luckily, Skeleton (kitori.unplugged) made a colour called Pastel Fury that suits Angharad just fine! Of course, it comes in other colours as well. Angharad would only agree to be photographed in all of them if we let her wear the pink one first! Here’s the Blood Lust colour; it’s a combination of reds and greys that Angharad said made her feel like devouring the flesh of her enemies, and possibly even a few friends! We figured we’d intersperse colours Angharad was likely to like with colours she might not like so much. She loved the combination of white and blue here and even insisted on wearing the cosmic tights. Again. This one is so candycorn Angharad couldn’t possibly hate it, even though she did comment that it’s not fair to make someone with yellow skin dress in orange. We compensated by adding the green leaves. Pumpkin Passion is 31% off at Trick or Treat Lane. Trick or Treat Lane opens tomorrow! There’s a lot of great stuff to see and experience, and BCreative Wilde has as usual done a bang-up job on the event layout and decoration. It’s fun just to walk about, but don’t forget to bring a bit of dosh…. I miss my Gran. Of all the people in my (adoptive) English/Welsh family, it’s her I’d really like to talk to. Because she’s the one who knows how it all happened, I’m sure of it. She handled the deal with the Sidhe, she arranged the “private” adoption for my London parents. And that means she might know who my father is, or at least be able to tell me a good story. But I’ve followed that advice given to me by the Ferryman years ago. I’ve never tried to find my old family, and that includes Gran. At first, it was hard, but living in Realms without technology created some distance. Now that I do have access to technology again, I’ve too much to do to waste even a few hours on what I suspect would be either fruitless—or painful. She had the best house in mid-Wales, set back, and in October I’d visit her, from about mid-October through the first week of November. Going to the University school had its perks, and one of them was being able to take holiday without them getting all uptight about it. Now, I can see it only in memories. And when I remember it or dream of it, I’m always some funny amalgamation of who I am now and who I was then. 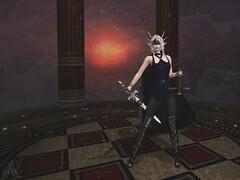 Here I’m in one of my Elf-Clan outfits (though when I look more closely, it really looks like the work of Senzafine, and I’d know that stuff anywhere). I remember that tree being the tallest tree in the world, and the little lighted garden shed my grandmother tended plants in all year round. In my memory, I can look at it both with the sense of wonder I always felt going there, and from a more calculated, adult perspective. While we visited at other times of the year, my Autumn trip was always just me, alone. My parents, unlike me, couldn’t get away from their lecture halls for three weeks in October and November. No; for that time, she wanted me there by myself. She wanted me for Samhain. I used to think Hallowe’en was pretty naff, and Gran used to make jokes about it, too. But, she said, it was also the old New Year, and she wanted her granddaughter there with her, to celebrate that time. I don’t remember us doing anything particularly special or anything that in my child mind felt strange or weird around that time. We had a nice dinner, sometimes with my Great-Aunts from Aberystwyth when they could be bothered to come. Gran always set an extra place at the table: she said it was for Granddad, whom I never met. Eventually, I read about dumb suppers, probably in secondary school, and I recall asking her about it. “Clever clogs,” she said. And there the discussion ended. We never went to the village Bonfire Night celebration. Instead, Gran got my uncle Huw around to build a huge bonfire in the back garden, which was once Granddad’s barley and vegetable patch, she always said. Now I think of it, it was a bit too big for the usual back garden, but mid-Wales is much more spread out than London, so I never questioned it. I’d watch from the window of the big house: you could just see the garden area if you looked just-so through the trees. He spent hours building a tower of logs while Gran and I made the Guy out of straw. She’d invite all her friends and a few children I knew from the village, and we’d have our own fire, far from the crowds and the fireworks. I’m sure I’m thinking about this now because it’s just turned October, and though Faerie doesn’t change with the seasons as profoundly as other places, we still celebrate them and consider the cyclical nature of the world and the Realms around us. Lately, I’ve been thinking: if I could relive any event from my childhood, it wouldn’t be Mum’s lavish birthday parties, or getting my PhD, or even that first kiss from Richard. It would be staring, transfixed, at a fire that seemed ten times as tall as I was, sparklers in my hands. But I wouldn’t go back to one of the ones with loads of people. I’d go back to the last one, the year I was twenty-one, the one where it was just Gran and me. She got village boys to build the pyre, and we made the Guy same as always. The boys scampered off to the village celebration, so it was just us, staring up at the fire, silently watching the effigy burn. Uncle Huw had died just a few months earlier, so it felt like a sombre occasion. Gran had tears in her eyes for part of that fire, and I thought at the time she was grieving for her son. Now I wonder if she wasn’t also bracing herself against the knowledge that I too would disappear from her life before the next Bonfire Night. It’s hard to believe I live in a castle now. Well, I live in a castle for the moment, at least until this internship is over and I have to go on to … to whatever’s next. Right now, it still feels as if I’m waking up in a fairytale every morning. I’m sure that will change—even if, right now, I can’t imagine ever getting used to waking up in a freaking castle. Anyway, that’s not even the point of this. I’ve been trying to perfect my image, my persona, for when Awenia opens to the public. The Queen is off on some recruiting mission; she’s trying to get more Fae to be part of Awenia’s staff. She wants to get them all moved in and settled into their roles before the whole place is teeming with tourists, as she says. I have a feeling it will take a while before we are at the “teeming with tourists” stage, but what do I know? And again, that’s not even the point of this. Because I’ve been trying to perfect my image, I’ve been spending a lot of time wandering around Awenia. And I can tell you right now, it’s weird up in here. Stuff changes every day. And I don’t mean like, someone comes along and plants flowers. I mean, like, a whole building disappears overnight. Or sometimes just for a few hours. Small forests come and go here. And today, beyond the Queen’s roses, a circle of stones appeared. Now, I am one hundred percent, bona fide pureblood Lios Alfar, but I’ve never seen a place where stuff changes like this. It’s like the whole place is made of some kind of magical liquid or something, and sometimes stuff just oozes into other …. no, that sounds pretty foul; forget I said it like that. I’ll work on a new metaphor. Now, my home Realm of Cymrien has a lot of stone, but it’s mostly used for farm fences, shoring up shorelines (yeah, I know. We can’t always have perfect word usage), and the occasional large building. But wood is sacred to the gods, and Cymrien temples are made of wood. While I’m sure visitors from elsewhere would be amazed by some of our live wood temples, I’ve always been fascinated by monuments made of dead stone. Our templebuilders, despite some dissent in the ranks, won’t even use petrified wood for temples, because this wood has died. Many of us do wear jewellery made of petrified wood, however. But I’m getting off topic. Again. The point is, a freaking circle of stones appeared just outside the Queen’s castle. And I’d never seen one before, not up close anyway. I mean, there are some big stones up in the Fae Forest outside of town, but they’re mostly just single stones, or like three stones piled up together to make some kind of giant, peculiar table. I might have run toward the stones. OK, I did run. But who knows how long stuff will stay, and it was important to me to get close enough to at least take a selfie for Ma and Da back home. I used my drone to take this stone circle selfie. I love that you can see the Book Forest and the Awenia Treehouse in the background. I’ve not been in the treehouse myself yet, but the Queen tells me it will be a centre of diplomatic activity in Faerie, and also a place for her and her husband, Nathaniel, to get away from it all. She also says the views are great. I am looking forward to seeing it one of these days. So, the stones. Well, they are beautiful. And the roses growing here are life-blood red, different from the roses so nearby in the Queen’s garden. Now, I’m not the most observant girl, me; but I am sure I felt some kind of presence inside the circle. It had a calming and peaceful effect, which is the same feeling I get inside of a live wood temple, which if you don’t know is a circle of trees planted just so. Their roots grow together, they are carefully tended so that their branches intertwine, and eventually they grow into a roof so well woven that it keeps rain out. Some of them are thousands of years old. I will have to ask Her Majesty how such spirit can go into a material I always considered devoid of spirit. Meanwhile, I think I’ll just spend a few hours lying on my back in this circle, smelling the grass, watching the changing shadows. Well, all the fortunetellers say that, don’t they? And obviously, the Great Faire is coming up soon, so we will be taking a long journey there, and then the long journey of days itself so that we can enjoy the all-too-short wonders of the greatest gathering of folk in all the wide Realms. But that chance meeting with the fortuneteller at the art gallery opening just made me think, and you know what happens when I think. What happens when I think is, I dream. And I did in fact dream about going on a journey. A journey that required a boat. I wasn’t quite myself on this journey. And I had the certain knowledge that this was the most important journey I’d ever taken. And I had the certain knowledge that this was the most important journey I had ever taken. It’s funny, a dream like that, where you’re someone else. I could feel the knowledge of having navigated a small craft around into a closed harbour, the careful manoeuvring to get it up against the shore properly, the movement of the rudder. Before me, a great tree rose out of the grassy bank, and as I looked up into her branches, I could have sworn she wore the face of a woman. Setting: Pacific Northwest Forest on Awenia, designed by Dyisi.